Be Found. Sell Online 24/7. We’ve combined WordPress with WooCommerce in this professional eCommerce business package so you’ll have complete control over your website pages and quickly start selling online in no time. Includes everything you need to showcase your products online, and tell the world all about them. Social media profiles setup and more! Send us your details for special pricing and let’s get started with an eCommerce website you can be proud of – and start enjoying excellent returns on your investment - 24/7! The content management system (CMS) built into WordPress makes it easy to create pages, write blog articles, embed audio and video, manage your image assets, engage with customers, and take control of your own website. Matched with WooCommerce, it doesn’t matter if you’re a manufacturer or distributor, a retailer, photographer, an artisan offering hand made arts and crafts, or other products you’d like to showcase or sell online 24/7 – our package has you covered NOW and for the FUTURE. You can read all about WooCommerce features on the WooCommerce website. WooCommerce is built using WordPress best practices both on the front and the back end. This results in an efficient, robust and intuitive eCommerce storefront or catalog only website. We’re dedicated to building your business a better website! You’ll find that our complete approach to web development not only gets faster results, but also saves you money in the long run by getting the job done right the first time. WooCommerce is built to allow flexible, modular plug-ins that may further help your online functionality or back office productivity. Contact us for pricing on additional modules required, and/or adding your entire product line for you. Have just a few items to sell using PayPal? If so, you may not need an enterprise level shopping cart. We have a great deal on a professional, mobile-friendly business marketing website with Blog and SEO. 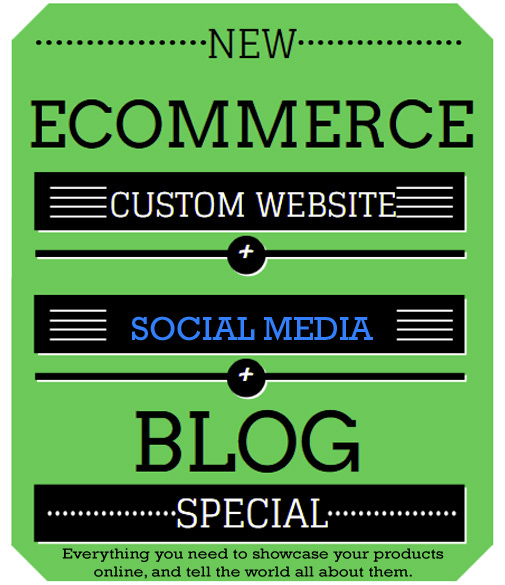 Find out more about our Business Marketing with Social Media and SEO Web Design Package and get up-and-running fast!